I defended my dissertation proposal in early 2008 but the majority of the literature most relevant and helpful to my doctoral research surfaced in 2009 and 2010. So I’m rather grateful to the PhD program at The Fletcher School for letting me run with my chosen dissertation topic given the limited empirical literature to draw on back then. The book is getting superb reviews, and that is absolutely no surprise. This is truly the best book I’ve read on the topic of my dissertation thus far. Why? Howard’s research design and mixed-methods approach is by far the most rigorous one in the literature to date. I therefore plan to dedicate a few blog posts to summarize Howard’s approach and findings, starting here with the book’s prologue: “The Revolution in the Middle East will be Digitized,” which focuses on the Green Revolution in Iran. Below are some excerpts and commentary that reflect some of the key arguments from this first section of the book. One of the main roles that information and communication technologies (ICTs) played in Iran was dissemination, which had a second-order effect on increasing levels of participation both in the streets and online. Like Malcom Gladwell, Howard also addresses the role of strong and weak-ties in digital activism. To learn more about Gladwell’s point of view (and mine) regarding the question of social ties, please see my previous blog post here. Howard’s balanced approach to the impact of ICTs on democracy is one of the main strengths of his book. That last paragraph resonates with me and relates to this idea of information cascades that Dan Drezner has written about here. The momentary window of opportunity that reversals information cascades offer can be used to catch dictators off-guard. This explains why preparedness and training is important. This idea of shared awareness appeals to me a lot, not least because of my work on the Ushahidi platform since the tool—when used correctly—can generate shared awareness. But why is shared awareness even important in this context? This last question is spot on and for me the correct way to phrase the debate on digital activism in repressive environments. The question can also be applied to deployments of the Ushahidi platform, i.e., is the lack of impact of an Ushahidi deployment a technological or social failing? Will Heaven of the Daily Telegraph and EA‘s Josh Shahryar have been engaged in a battle of words on the role of Twitter in Iran. I think the battle has now drawn to a close. Given the popularity of my previous post on “Where I disagree with Morozov and Shirky on Digital Activism,” I thought I’d continue the series, which also helps me keep track of my notes for my dissertation. I copied and pasted this lengthy exchange in a Word document (available here) and did a word count. The debate generated over 7,500 words. That’s about 12 pages, single-space of font-size 10 text. I’ve re-read this document several times and I’m not quite sure what the debate ultimately amounts to. They both make very good points but neither is willing to concede that. In any case, here are my individual comments on their exchange. Will: It’s deluded to think that “hashtags”, “Tweets” and “Twibbons” have threatened the regime for a second. Really? Then why would the regime or sympathetic elements within Iran try to shut it down? Will: Here’s the other thing “social media experts” will forget to tell you: dictatorships across the world now use their own tools to hunt down online protesters. I would like to challenge Will to find one “social media expert” who forgets that digital repression is real. Please see my previous blog post on this. Will: And it is foolish to think that their use [Tor, Freebase] guarantees safety: if the Revolutionary Guard were to find someone using the software, the consequences would be dire. Both Will and Josh are fixated on technology at the expense of tactics. I think they’d find this guide on how to communicate securely in repressive environments of interest. There needs to be more cross-fertilization between civil resistance strategies and digital activism tactics. See this post for more. And before either fault me for making the above guide public, all the information in said-guide is already public and available online. Repressive regimes may very well be aware of most of the tactics and technologies used, but just like chess, this doesn’t mean one side can defeat the other at every game. Will: When you consider the danger posed to Iranians by online participation – compared with what online participation has achieved – the overall result is hardly tangible, and certainly not worth the risks which have been undertaken. True, perhaps, but a little too passive a statement for my tastes. Those risks are not static, they can be reduced; hence the guide. And hence the need for more education and training in digital activism around the world. See Tactical Tech‘s excellent work in this area, for example. One other point that Will overlooks (understandably since he doesn’t live in the US) is the stunning shift in perception that took place in the minds of Americans when viewing Iran’s post-election protests. Prior to the elections, the word Iran would generally evoke the following: “Nuclear weapons”, “Kill the Great Satan”, etc. But after young Iranians took to the streets and the protests were documented on Twitter, Facebook and Flickr, many Americans finally realized that “the other” was perhaps not that different. The shift in mindset was huge. Josh: The fact that Iranians are dying is not the fault of Westerners. It is not even a fault. It is a sacrifice that Iranians must make to gain their freedom. The Responsibility to Protect (R2P) suggests that state sovereignty is contingent on a state protecting it’s citizens. A regime that kills some 400 citizens in response to street protests should hardly have the right to remain sovereign. There should be a Chapter 7 UN mandate with 20,000 observers in Iran to prevent any more violence. Realistically though, I don’t know what the solution to this crisis is, but I do feel that we’re all responsible for the bloodshed. I definitely disagree with Josh’s implication that revolutions require death and destruction. “Be smart, don’t be dead” is what I tell political activists. There are very good reasons why nonviolent action is called “A Force More Powerful.” Digital activists really need to get up to speed on nonviolent civil resistance tactics and strategies just as the latter need to get up to speed on how to communicate more securely in repressive environments. An Analytical Framework to Understand Twitter’s use in Iran? The digital activism and resistance witnessed in Iran go to the heart of my dissertation research, which asks whether the information revolution empowers coercive regimes at the expense of resistance movements or vice versa? Iran is one of my case studies for my upcoming field research in addition to Burma, Tunisia and Ukraine. However, what I haven’t seen in the blogosphere and mainstream press is the application of an analytical and theoretical framework to place Twitter’s use in Iran into context. For example, just how important is/was Twitter’s role vis-a-vis the mobilization and organization of anti-government protests in Iran? We can draw on anecdotes here and there but this process is devoid of any applied social science methodology. This post seeks to shed light on how, when and why information and communication technologies (ICTs) are used by resistance movements in repressive environments. The framework I draw on (summarized below) is informed by Kelly Garrett’s excellent publication on “Protest in an Information Society: A Review of the Literature on Social Movements and New ICTs” (2006). 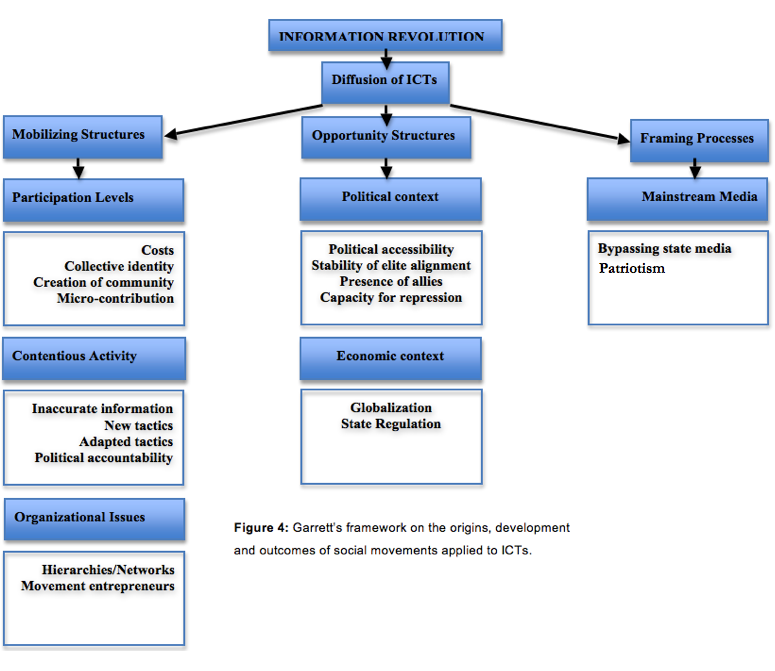 The framework seeks to “explain the emergence, development and outcomes of social movements by addressing three interrelated factors: mobilizing structures, opportunity structures and framing processes” within the context of ICTs. (The figure below is excerpted from my dissertation, hence the figure 4 reference). Mobilizing Structures are the mechanisms that facilitate organization and collective action. These include social structures and tactical repertoires. Opportunity Structures are conditions that favor social movement activity. For example, these include factors such as the state’s capacity and propensity for repression. These activities are of course not mutually exclusive but often interdependent. In any case, taking the analysis of ICTs in repressive environments to the tactical level facilitates the social science methodology of process tracing. We can apply the above framework to test a number of hypotheses regarding Twitter’s use in Iran. Take Mobilizing Structures, for example. The following hypothesis could be formulated. Hypothesis 1: The availability of Twitter in Iran increased participation levels, contentious activity and organizational activity. These causal chains, or “micro theories,” are posited with the “⎥” marker to signify that the causal relationship is contended. The direction of the arrows above reflects the theoretical narratives extracted from the theoretical framework presented above. Note that the above “micro” theories are general and not necessarily reflective of Twitter’s use in Iran. When the arrows are tallied, the results suggest the following general theory: there is a direct and positive relationship between the impact of Twitter and the incidents of protests and riots. The next step is to test these “micro theories” in the context of Iran by actually “weighting” the arrows. And of course, to do so comparatively by testing the use of Twitter relative to the use of mobile phones and the Internet. Furthermore, the results of this hypothesis testing should be compared to those for Opportunity Structures and Framing Processes. I plan to carry out field research to qualitatively test these hypotheses once the first phase of my dissertation is completed. The first phase is a large-N quantitative study to determine whether increasing access to ICTs in repressive regimes is a statistically significant predictor of anti-government protests. Mobile phone users in Iran who wish to use the SMS feature on their mobile phones will now be required to apply for security clearance by the Ministry of of Intelligence and Security. Sending SMS deemed contrary to national security will be punishable by law. Any change of address by the subscriber of the service must be reported promptly to the relevant authorities. It is the security agents who decide which SMS are in breach of national security . In October, A number of senior officials of the Iranian regime’s Ministry of Culture and Islamic Guidance (MCIG), the main body for imposing censorship, have expressed its deep concern over the use of SMS messaging by the Iranian Resistance’s network inside Iran (source). Some 20 million text messages are sent every day in Iran according to some sources. Will the new regulation have a significant impact on that number? If so, will the regime care at all about the loss of revenue? Harvard’s Berkman Center has just released a fascinating study on the politics and culture of the Persian Blogosphere. Berkman’s social network analysis reveals four major network clusters (with identifiable sub-clusters) in the Iranian blogosphere. The authors have labeled the four clusters as 1) Secular / Reformist, 2) Conservative / Religious, 3) Persian Poetry and Literature, and 4) Mixed Networks. Surprisingly, a minority of bloggers in the secular/reformist pole appear to blog anonymously, even in the more politically-oriented part of it; instead, it is more common for bloggers in the religious/conservative pole to blog anonymously. Blocking of blogs by the government is less pervasive than we had assumed. Most of the blogosphere network is visible inside Iran, although the most frequently blocked blogs are clearly those in the secular/reformist pole. Given the repressive media environment in Iran today, blogs may represent the most open public communications platform for political discourse. The peer-to-peer architecture of the blogosphere is more resistant to capture or control by the state than the older, hub and spoke architecture of the mass media model. So are we likely to witness iRevolutions in Iran? The question at hand is not whether the Iranian blogosphere provides a Samizdat to the regime’s Politburo, but whether the new infrastructure of the social nervous system, which is changing politics in the US and around the world, will also change politics in Iran, and perhaps move its hybrid authoritarian/democratic system in a direction that is more liberal in the sense of modes of public discourse, if not necessarily in a direction that is more liberal in the sense of political ideology. Berkman’s next step should be to move from static network analysis to dynamic analysis. The topology of the network itself over time should reveal other interesting insights. I would recommend they look up Mark Newman at the Santa Fe Institute. Another software program for networks analysis that I would suggest they use is one used to model foodweb dynamics in 3D. This clip demonstrates the program’s features. Update: I just met with Josh Goldstein, a researcher at the Berkman Center who contributed to this study. Josh was interested in getting more of my thoughts on possible next steps regarding future research using social network analysis (SNA). I suggested they track network parameters (such as degree centrality) over time and find explanations for changes over time. In other words, plot the number of edges that each node (blogger) is connected to over time. For example, how does degree centrality change within the different clusters identified by Berkman after a terrorist events, i.e, events exogenous to the network? Recent research suggests that blogs display a power law relationship between frequency and magnitude, i.e., there are many nodes with few edges, and few nodes with many edges. Does the Persian blogosphere follow this distribution? Why or why not? Does the slope of the power law distribution become flatter or steeper following crises events? Again, why or why not? What social science explanations account for changes in network topologies over time?